I’m going to be honest here. Before kids I was NOT a Halloween fan. I don’t like things jumping out at me, scary movies, or the massive amounts of candy temptation. However, I had my son and realized it is so much more fun with kids. I mean, kids in costumes?! It doesn’t get much cuter than that. But while they are so cute in costume it may feel overwhelming trying to capture them on Halloween. That’s why I’ve put together these 5 tips for magical Halloween Photos to help you better photograph your kids this Halloween! Take your photos before Halloween. Let’s be real, the last things kids might want to do is pose for photos, especially when there is candy to be collected. Take some pressure off and take photos before Halloween. Kids love to dress up in their costumes and will love the opportunity to wear them early. Plus, it often rains on Halloween around here, so I pick a day when the sun is out (or it’s at least dry) and do photos then. It’s a win-win. The location for your photos can really make a photo stand out. I have three favorite types of locations to do Halloween photos. Just inside the garage with the door open. I let the light shine on my kids while the background goes black and the focus can be just on their costume. Pick a spot that goes with their costume. One year my kids were a UPS delivery guy and a mailman. So I gave them some packages and set them up in front of the house like they were delivering packages. Take advantages of the colors of fall for your backdrop. One year I set the kids up where there was this gorgeous tree that had dropped tons of leaves. 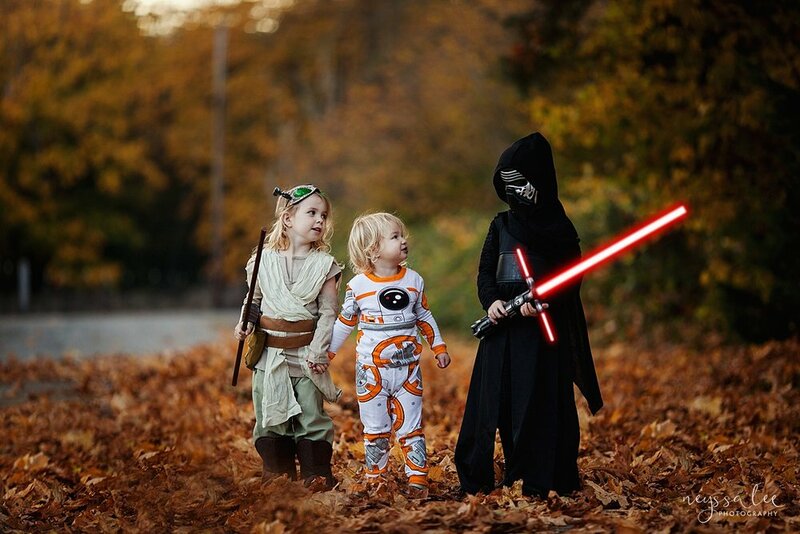 I loved the images as they had two of my favorite things - kids in costume and beautiful orange leaves. Let them be silly (or serious, or scary). When you get your kids into the character they are playing they forget they are taking photos and just have fun. If they are a lion ask them to roar as loudly as they can. If they are a princess, have them twirl. Or ask them what their character says or does. Does their costume come with a lightsaber or a fairy wand? Those details are worth photographing. Get up close and focus on the way their hands hold onto their costume accessories. Other favorite details are the way they walk in the costume (my son as Eeyore was ADORABLE to watch him walk), or the way they kept eating their props (Sawyer was Snow White and kept eating her red apple). I don’t know how long my kids will be up for family themed costumes, but as long as they do, I’m going to get in on the fun and dress up with them too. One year we all went as characters from Star Wars so I handed the camera off for a friend (the amazing Megann Robinson) to snap a photo of all of us together. The kids still love to see where mom and dad were Han Solo and Princess Leia! Get out there, and I can’t wait too see what you capture. Share it and tag #nlp_shootandshare for a chance to be featured in my stories! Here are a few more Halloween photos to help inspire you!